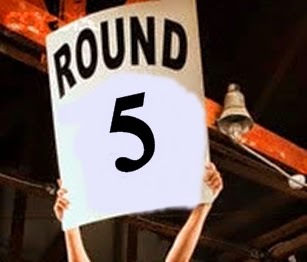 We top off the week with the final bout in the second round of the WRiTE CLUB play-offs. In this round our ten contestants have been battling it out with brand new writing samples, which could very easily turn the tide. The bouts will be posted on Mon - Fri, but the voting will remain open for all bouts until Sunday at noon. And now...stepping into the ring with a brand new story to tell...here is...Nanato4. Augusta was born into privilege. The colored woman who wet-nursed her, burped her, then changed her soiled nappies kissed her tender pink cheeks before handing her over to her indifferent mother. Growing up in Mozambique in a world of topsy-turvy love, then schooled in apartheid South Africa left her with an unhealable schism of the mind. She needed to sort out the truths she was told from the truths she believed. She required no sleeping car on the train to Johannesburg, wanting to spend the entire ten -hour journey gazing at the landscapes of the countries she was leaving behind. Vast swatches of golden land slipped by, peppered with grand acacia trees, their upswept limbs sheltering nyala and zebra and the occasional elephant. Biting her lip to feel physical, rather than emotional pain, she forced herself to watch every frame of the film her window created. Slowly, slowly, at about intermission, the scene changed, as shanty huts appeared, dark women scrubbed clothes on washboards in muddy streams and children scratched games into the dirt. The huts grew closer and closer to each other as they neared the city, until they shared roofs of tin, rough-hewn wood and woolen blankets. There were no real walls between the shelters under this crazy quilt umbrella, a family of six was visible, living a crusted bedsheet away from the neighboring clan of eight. It helped, seeing this. She was leaving her native continent for a better place. A land of promise, and equality and prosperity: The United States of America. The name itself brought her joy, a small smile formed on her lips as she finally closed her eyes to picture those amber waves of grain. She was met, as she disembarked from the ship in New York City, by her father’s older brother. Uncle Willy was dashing, one of the first new words she acquired in her new world, from an elderly shipmate she had helped down the gangplank. It was 1965, and she would soon learn that her brand new word was horribly out of date. Augusta listened with one ear as Uncle Willy ticked off details such as her living quarters, roommates, immigration papers and so forth, while her other ear was filled with the sounds of a clanging, shouting, sireny city. The wide sidewalk was thick with swarming, indifferent people, a mass of busy human ants on their way to something important. She was smacked in the shoulder by a man going the opposite direction. She turned, expecting an apology, but instead got a curious display of his middle finger. And with their own brand new piece of writing, welcome back to the ring....Swick. Leave your vote and we'll see you back here next week for Round 3! Another bout between two well-done pieces. Nanato4 gives a compelling situation and a sympathetic MC, and the writing has many nice touches. It does feel perhaps a little too remote because it's all expository writing with only snippets of the character in a scene and the author telling us what Augusta is feeling. In the span of only 500 words we're told she's born to an indifferent mother and then she's whisked across a ten-hour train-ride and an ocean-crossing ship-ride to a crowd of indifferent New Yorkers, and about the only action the reader gets to witness first-hand is lip-biting, window-gazing, some one-sided conversation, and bird-flipping. Still, it feels like the pace will eventually settle down and we'll be able to close in on the MC and get to experience things in real-time along with her, and the writing makes me confident that it will be enjoyable. There is a lot of potential in this story. But with Swick, I don't have to just trust that a close-up scene with the MC will be enjoyable -- the author gives us one and proves it. The dialog and descriptions are balanced extremely well and I'm fully immersed in the tension and drama of the scene. The situation unfolds well and I get to experience it first-hand along with Robyn, something I find much more enjoyable than a lot of exposition. I find very little to quibble with in this piece. So while I enjoy both, I have to give this bout to Swick. I have to abstain on this round. I enjoyed both, however. Going to go with Swick. Nanato was intriguing, but felt a bit more like character background than a story. Always tricky with these chunks of bigger things, would love to explore both in their entirety! Here are two well-written pieces! Nanato4's piece was clean but lacked real tension, whereas Swick delivered on it from line 2. It's Swick for me. Tight, electric writing. Nanato4's piece is evocative, and I'd read more, but the exposition makes it a tough sell when we only get to see 500 words. I really liked both of these, but I'm going with Nanato4 this time. It didn't have as much tension as Swick, but it was clean and a pleasure to read. I still love Swick, though. I like the idea behind the first one better, but the second executed the story best. Swick. I like the set up of the first one, but with the heavy exposition, I didn't fully connect to a character. The second has a nice balance of character, action, and setting, and I love the tension in this piece. My vote is for Swick. Swick. Gritty and grabbed my attention immediately. Just wanted to say good luck and what a neat thing you've got going. Swick for sure, immediately invested and you were given a good sense of the story immediately. Swick for me! The writing in Nanato was lovely, but the action in Swick was more engaging and pulled me right in. I do love the action in Swick, but I know I'd buy a copy of the story from Nanoto4, so that's my vote. I truly enjoyed both of these. I feel that if I hadn't read Swick's original entry, I'd be lost here. But Nanato4 - the writing painted here has captivated me. I want to read more. So you get my vote. Nanato4's style in this excerpt is in many ways more to my taste -- I love the descriptions, for example -- but all the exposition, especially in the opening paragraph, pushed me back from the story. I'd rather the author had simply jumped in with the train journey and kept closer to Augusta's POV. Swick's entry here, just like the original one, comes across as skillfully done and pretty polished, even though I think this passage is a bit hurried and rather sparse even for an action scene. Also, as I've mentioned in other critiques, I don't really care for the use of present tense. But the concept of this story is certainly clever -- I'm not aware of any other Robin Hood retelling that features such a refreshing and unexpected twist on the setting and characters. Swick's last line is just killer. And therefore Swick has my vote. Swick gets my vote. It makes me want to keep reading.